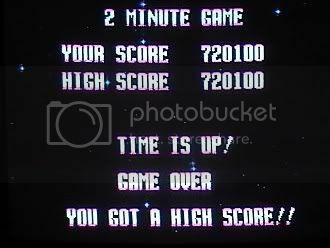 After watching the Chicagoland Autumn Carnival contestants tear it up and seeing Andi get a 706,100, I sat down to beat it tonight and made what looked like a totally perfect run, finishing oiff the boss with 23 seconds left, setting a new high score at 720,100. Puts you in the #2 spot on the forums, right? The guy in first seems like he might be using some sort of super-turbo controller for his carnival game scores. They seem so far outside of the realm of what looks possible. I did send him a pm on shmups to see what's up - if he's using some sort of controller or something.